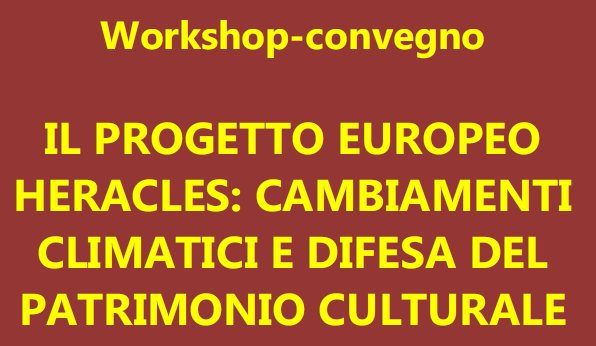 In the framework of the foreseen HERACLES activities dedicated to increase the awareness of the civil society toward the themes of the project, a Workshop was organized, mainly by CNR, UNINOVA, Gubbio Partners, Umbria Region, Provincia di Perugia and professional associations. This event was conceived in two parts: the first one in the morning, dedicated to a public and wide audience from civil society, technicians and sector experts. The program was organised including policy makers from local, regional and national Institutions (MIBACT-Italian Ministry for CH, Regione Umbria, Comune di Gubbio), as well as high-level professionals, professional associations and important national journalist (from Italian newspaper Corriere della Sera). CNR, through the HERACLES coordinator, and UNIPG presented the HERACLES project and related activities. At the end a Round-Table was organized and chaired by the HERACLES coordinator. The second part, in the afternoon, was instead dedicated to a Participative session, debating directly with people important aspect of the effects of Climate Change on cultural heritage and the contribution of HERACLES project in terms of possible solutions. This discussion was guided by and based on a questionnaire that was previously sent to the audience. Very interesting suggestion comed out from the audience and were taken into account in the planning of the further HERACLES activities. Furthermore, news were also diffused through social media,(e.g. Comune di Gubbio Facebook, Gubbio Major web-page, TRG web-page) and bill posting. The total audience could be estimated in 150.000 subjects/day. The flyers of the event are attached.